Macau (sometimes referred to as as Macao) is one of the most unique destinations in Asia with its East-Meets-West architecture. Having said that, I really wanted to share with everybody the beautiful architecture there, making this a non-food related post. First ever one! The Historic Centre of Macau is a collection of over twenty locations that witness the unique assimilation and co-existence of Chinese and Portuguese cultures in Macau, a former Portuguese colony. It represents the architectural legacies of the city's cultural heritage, including monuments such as urban squares, streetscapes, churches and temples. Below is Senado Square, the center of the former Portuguese colony of Macau. Senado Square has been Macau’s urban centre for centuries and is still the most popular venue for public events and celebrations today. Tons of tourists that day as it was the weekend before Christmas. Holy House of Mercy - Established by the first Bishop of Macau in 1569, this institution was modeled after one of the most prominent and oldest charitable organizations in Portugal, and was responsible for founding in Macau the first western-style medical clinic and several other social welfare structures that still function to this day. One of the principal roles of Macau’s Holy House of Mercy was to provide support for orphans and widows of sailors who died at sea. Banco Nacional Ultramarino - This was not located in the Historic Centre of Macau but just outside of it. I took the picture it because I like how it's pink :) This was a Portuguese bank with operations throughout the world, especially in Portugal's former oversea provinces. It ceased existence as an independent legal entity in Portugal following its merger with Caixa Geral de Depositos, the government-owned savings bank, in 2001. Casino Lisboa - One of the most famous hotel casinos in Macau. This three-storey complex was built in late 1960s. The original casino and the 12-storey round hotel tower were built in 1970. A 270-room extension was added in 1991 for a total of 927 rooms. In 2006, another extension, the Grand Lisboa, was built next to the current complex. Therefore a total of 2362 rooms are in place in Hotel Lisboa as of 2010. 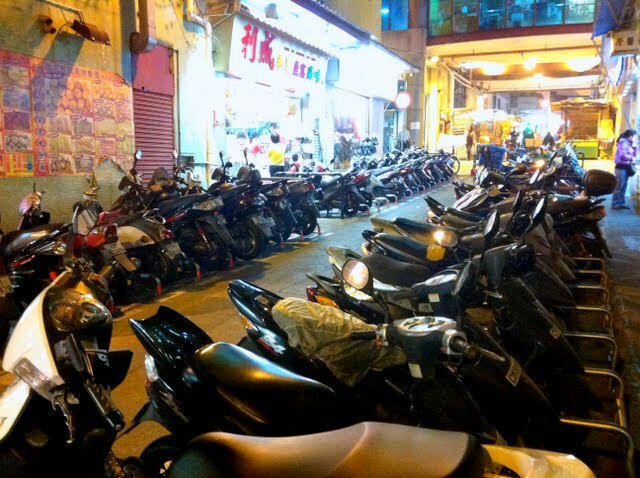 Lots of scooters in Macau. Ruins of St Paul's Church - The Ruins of St. Paul’s refer to the façade of what was originally the Church of Mater Dei built in 1602-1640 and the ruins of St. Paul’s College, which stood adjacent to the Church, both destroyed by fire in 1835. As a whole, the old Church of Mater Dei, St. Paul’s College and Mount Fortress were all Jesuit constructions and formed what can be perceived as the Macao’s “acropolis”. My back to the Ruins of St. Paul, looking out. It is interesting to see the modern retail shops incorporated in the old style buildings. A lot of food vendors on this street. I passed by the casinos in Macau when I was on the bus but did not make it a point to walk around. I really have no interest whatsoever in the "mini-Vegas" there because believe me when I say I've been to Las Vegas enough times already in my life!